We put an end to Christmas here yesterday, and packed up the ornaments, unwound the lights, folded up the stockings, and hauled the tree outside. It’s the first year in a long time that we even opened all the ornament boxes. When I was growing up most of the ornaments on our Christmas tree were the fragile glass balls Mom had bought at drugstore, hung next to the colored lights on the inner branches, and then there were a bunch of homemade ones on the outside, wooden and baked salt-dough. 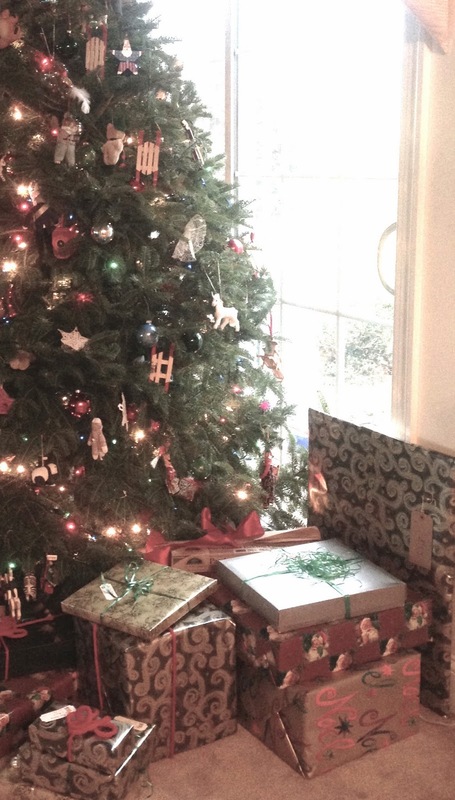 My mother was known for being particular about her tree, and disdained tinsel. One year, Mr. and Mrs. C_____came and threw tinsel on our tree anyway. My mother was silently angry about it, but waited until spring for her revenge. She had a strong throwing arm, and tee-peed the tallest evergreen in the C______’s yard. In my mind it was the most precisely tee-peed tree ever seen in the neighborhood, with toilet paper reaching from the ground, all the way up to the highest branches and all the way down the other side. My mother did nothing half-assed. The year that I came home for Christmas with her first grandchild, my mother had replaced all her meticulously handmade ornaments with new ones, had bought twelve place settings of Spode Christmas tree china, and hired a professional photographer for posed pictures. It was all perfectly new, and meant to look like it had always been this way. When she died, my mother left behind a lot of Christmas stuff, and since I already had my own, I only took a single box of ornaments and a box of wrapping paper and ribbon. Eleven years later, I have not used up the paper yet, and I’ve barely put a dent in the ribbon. I have more ornaments in my collection than just that one box from Mom; she sent me a few new ones every year. I have a lot of weird animals wearing clothes, and some not wearing clothes. I also have a commemorative ornament from a former employer, and “World’s Best Teacher,” from a student, and “Baby’s 1st Christmas,” but I don’t remember which baby it was for. There is a Thomas the Tank Engine with my oldest son’s name painted in large letters on it, and James and Percy with his sibling’s names. Both of my younger two children have asked to be known by different names in the past year. How can you not honor such a request? No, neither my husband nor I remember every time, but we try. The children whose names are painted on the red and the green engine ornaments are not different from the young adults who now go by other names, but am I dishonoring my kids by hanging the ornaments? Am I clinging to the identities we gave them as newborns? Maybe next year I will leave them in the bottom of the box. I have made three resolutions for 2015: to only use “LOL” when I actually laugh out loud, to write more, and to argue less. In support of the second, I have made the ambitious goal of blogging every week in 2015. As I write this, the moon is my witness (waxing gibbous, 88% illuminated). It isn’t quite full yet but it is shining on the bedroom floor, filling the space between the wall and me with pale parallelograms. I alway love how real your stories are. Finally, one of your blogs has caught up with me….and I've enjoyed it so much. I'm hoping you'll take the time to blog every week during this new year…….looking forward to it ! !